We are longtime fans of Labrador Retrievers. Our first lab when were married was Gretchen, a yellow lab who died in 2008 (“You were our first ‘child,’ a ‘counselor’ to us on occasion, and a constant reminder why a dog is a man’s best friend,” I wrote at the time). Now we have Whiskey, a “fox red” lab who has traveled with us all over, including sailboat camping at Lake Tahoe, and who fetches the New York Times daily. Labs are world famous for their companionship. America’s VetDogs placed a specially trained service dog with former President George H.W. Bush. Sully, a 2-year-old yellow Labrador Retriever, was specifically matched to provide support and companionship to Bush in his daily activities, as VetDogs reported this past summer. “Sully is named after former airline pilot Chesley “Sully” Sullenberger III, who became famous for landing a damaged passenger jet on the Hudson River in 2009. Sully the dog was raised and trained through the VetDogs prison puppy program, in which inmates raise future service dogs until the dog is about 15 months old. On Sunday night, Bush family spokesman Jim McGrath honored the service dog who accompanied George H.W. Bush during the former president’s final months. “Mission complete,” McGrath tweeted, showing Sully the dog. Sully’s Instagram page showed the same photo. 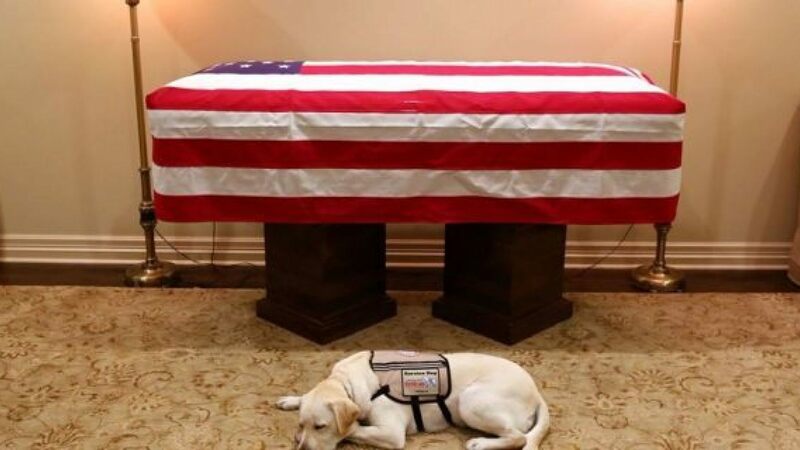 Former President George W. Bush “regrammed” the photo on his own Instagram, stating: “As much as our family is going to miss this dog, we’re comforted to know he’ll bring the same joy to his new home, Walter Reed,” the military hospital in Bethesda, Maryland. Next Next post: Is Trump shorting the stock market?